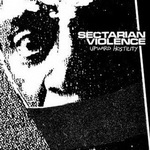 New Sectarian Violence LP coming soon! Carry The Weight Records will release 'Upward Hostility', first full length by Sectarian Violence, international straight edge done by dudes from some cool bands like Coke Bust and Stay Hungry. Expect ten tracks of raw and fast hc/punk in the vein of The Abused, Negative Approach and SSD! Grave Mistake will handle this release for the the kids in US.